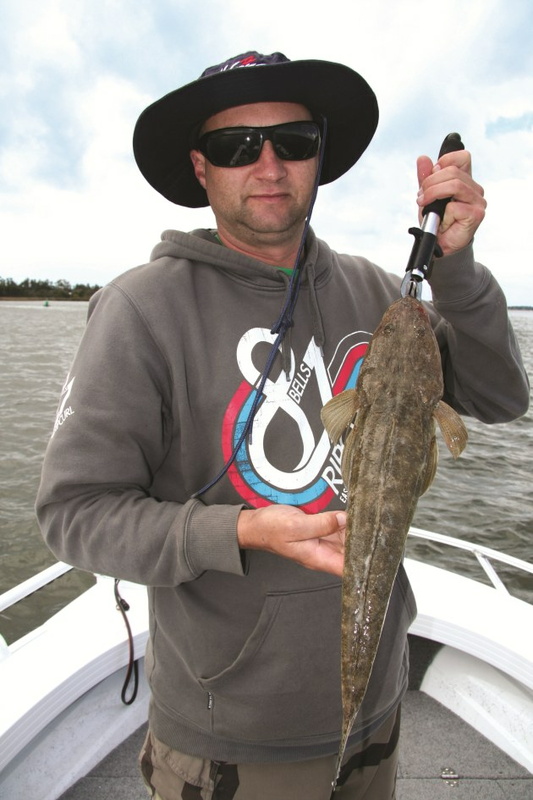 Flathead are well known estuary residents. NOT all kids or new anglers have a parent or mentor who can show them how to fish and it can be hard to get basic information to set them on the right path. While most articles assume readers understand the basics, often getting this information can be hard to obtain. In this article we focus on the basics, aimed at the new or inexperienced (but super keen) angler. An estuary is a partly enclosed coastal body of salt water. Most have one or more rivers or streams flowing into it, and with a free connection to the sea. They're common along our coastline, tidal and range in size from Sydney Harbour to tiny inlets and sheltered bays. Are estuaries good fishing spots? Absolutely! Most estuaries are good places to fish. Some species exist only in this zone while others visit at some point each year. Some fish come into the estuary to breed as the calm waters provides good habitat for the eggs and small fish to thrive. They also provide a food source for bigger predators. 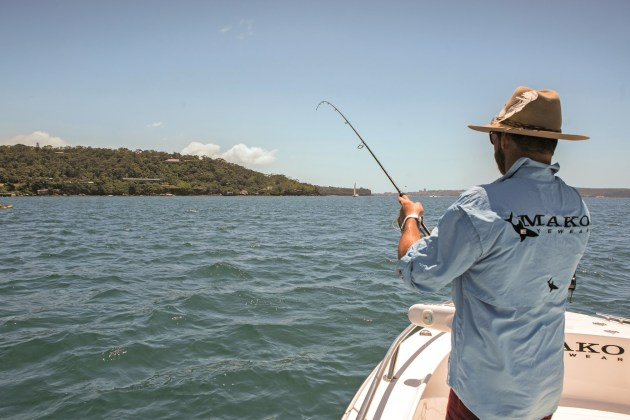 The other good thing about many estuaries is you can fish without a boat because there are often tidal flats and foreshore areas that produce good fishing. What is structure? Why do fishers look for it? Most estuaries are good places to fish. “Structure” is another term for channels, sand bars, weed beds, rock bars, mud flats and mangroves. It also includes man made things such as wharfs, bridges, pontoons, canals and rock walls. Fish are attracted to structure either as a place to live and shelter or to find food. Anglers know what types of structure attracts fish. They look for and fish near this structure to catch that species. Grazing species like bream and luderick might be attracted to rocky foreshores and wharf pilings because they like the aquatic vegetation and small creatures found there. Ambush predators like mangrove jacks prefer sites like floating pontoons and deep rock bars that allow them to attack passing bait. Whiting prefer to cruise across the silty flats where food including worms, crabs and small crustacean live. It's important to get a good idea what “structure” your target species prefers. Why is water “quality” important? Along with finding structure, learning to assess the water “quality” in your estuary is important for several reasons. Fish have a comfort zone which relates to temperature, salinity (saltiness), clarity and purity. Water quality changes constantly due to tide, wind and run off from rain. Crystal clear water, often brought in from the sea at high tide, is not always ideal as it makes fish shy and hard to fool. Muddy run-off often drives fish to saltier water sometimes offshore. Clean, cool water tinged green or brown is ideal. The angler who can find this type of water in an otherwise dirty estuary will often catch more fish. If a previously clean estuary colours after rain or strong wind it pays to check channels with lower tidal flows as they will retain better water for longer. The mouth will have cleaner water on the run in tide too. What lives in your estuary? Which species are permanent and which species come and go? Bream are one of the most commonly taregetted estuary species. Estuaries often have a variety of species that are reasonably plentiful and worth chasing. Some will be residents that spend most of their time here. Flathead are a good example. Others will be visitors, some for a tide, others for a few months. Tailor and salmon will follow bait fish schools into the estuary and can be plentiful if food is holding in the system. Fish populations vary in an estuary as the seasons roll on. In many there are “runs” (where fish school up) and there is a big increase in fish numbers. Mullet, luderick, garfish and bream are some species that “run”. To find out what the options are in your area visit the boat ramp and watch what is being cleaned on the fish tables. Go for a look along the edges to see what is browsing. Local tackle shops are mostly keen to help and the media has resources to assist. Aim to build up a picture of what is “on” in each season. What effect does the seasonal change have? Each season will see changes in the estuary’s resident population. Many species enter the next phase in their lifecycle with the change in season. An example might be that flathead in your area breed on the run up to the full moon in spring and they prefer to do this in clean cool water on a reasonably coarse sand bottom. Meanwhile, as the water heats up in late spring, garfish take up residence on the shallow weed beds and bite well on a rising tide. As the year rolls on it is exciting to think that soon a new species will arrive. You will need to develop a few different rigs and find good locations to get the best from this seasonal variation. If you check out a good estuary fisho’s tackle box you might find flathead lures, squid jigs and a luderick float all ready to do their particular job as each species makes its appearance. Sounds complex but this information is no secret and with some research you can work out when to expect each species in your estuary. What do fish eat and where do they find it? If you find the bait you will find the predators. It's important to know what each species eats as well as its preferred habitat. Then you can find its food source in an estuary and at least for a period of each tide your target won’t be far away. Hunters like flathead, barramundi, jewfish, tailor and salmon chase other fish, prawns, crabs and squid. Opportunists like bream will eat everything from fuzz off a rock to a small fish. Meanwhile, grazers like mullet, garfish and luderick eat mainly plant material. Most species will cross over if things are grim or hunger is a factor, so it is possible to hook a grazer on a flesh bait particularly in times of scarcity or in flood conditions. Just as a fish species might be either a resident or visitor so is the food that each species preys on. Invertebrates like crabs and nippers (bass yabbies, clickers, etc…) might be a year-long proposition while prawns and baitfish (herring, biddies or mullet) might “run” for several months. Worms and shellfish may be plentiful all year. Sometimes it seems the whole estuary is lifeless but if you look there will nearly always be something to eat. It has often been said that if you find the bait you will find the predators, and this is true. Size can matter in an estuary. Smaller waters can be very good fisheries but often hard to find bigger fish in. Some locations are now free of commercial fishing effort and the fishing is often a lot better than where netters are still working. Some waterways are polluted, and this may repel fish or taint them if you are considering eating your catch. What do I fish for? Select a species that is plentiful at the time. Look for structure and food they like and try to work out at what part of the tide they feed on. You could pick from a wide variety of species such as bream, flathead, whiting or luderick. Some estuaries seem over run with tiddlers. 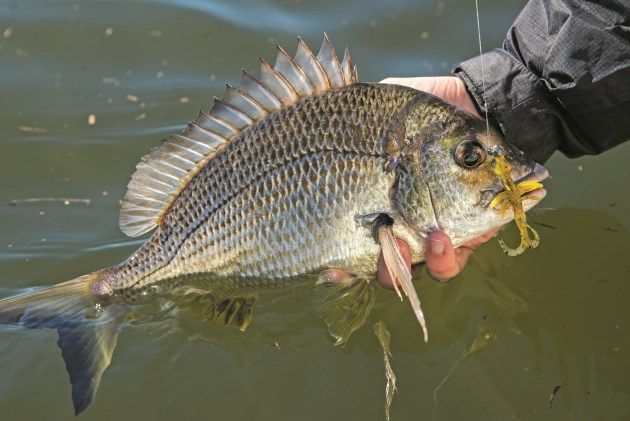 Undersized bream, whiting, tailor and other species swarm around stealing your bait as soon as you cast out. Let them go gently and don’t be put off as this shows how healthy and productive the system is. While catching tiddlers is fun, catching “legal” sized fish is much better. Fish you can keep for food are specified in your states’ fishing rules. It pays to record your trips in a diary. Note details including time, tide, water clarity, location, bait, moon phase and what the conditions were when you caught a few. You can use this information to build up a more complete picture of when and where the fish are likely to bite next time. You are now well on the way to graduating from novice to competent angler. Bait or lures? What gear do I need? Light two metre rods coupled with 2500-4000 size threadline reels are ideal for the estuaries. There's a choice about how you fish for your target species. Many anglers opt for a bait-based approach. If you do then it pays to gather your own because fish prefer live or fresh food over stale, long-dead frozen bait. Pumping nippers using a yabbie pump, gathering worms and trapping poddy mullet is time consuming but great fun. In many cases you fish where you get your bait. Scooping some prawns from the weed beds after dark can pay off the next day as a live prawn is fantastic bait. Using fresh strips of mullet will get you many more bites than stale dead bait. If gathering bait is not an option, then buying fresh or quality frozen options can work. The other method is to use lures. Some species such as flathead are aggressive lure takers while some other species are not so susceptible. Bream are reasonably difficult to fool while whiting are still very much a specialist option for most of us. Tailor, salmon and trevally can all be taken on lures and it is a fun way to go. No one said you can’t use both methods! A handline is the cheapest way to get started. If you're in for the long term, you will need a light two metre rod and 2500-4000 size threadline reel loaded with 2-4 kg line. Braided line is good because it lasts for many years. Use a monofilament trace to link the mainline to the hook or lure (500 mm is a good length). You might need some heavier mono of about 6 kg for trace and you will definitely need to learn a couple of basic knots. The net has many useful videos for knots and how to tie them. A small tackle box with terminal tackle (hooks, sinkers and swivels) and lures including some soft plastics, metals and hard bodies suitable for your target species. Match your hooks to the species mouth and bait size. You'll need a knife in a sheath, ruler to make sure your keeping only legal fish and a rag to wipe your hands. Pliers and scissors are useful to snip line and remove hooks. It pays to remain mobile and try different spots. A pushbike with a rod holder can be a very good way to work around an estuary. Use your eyes. 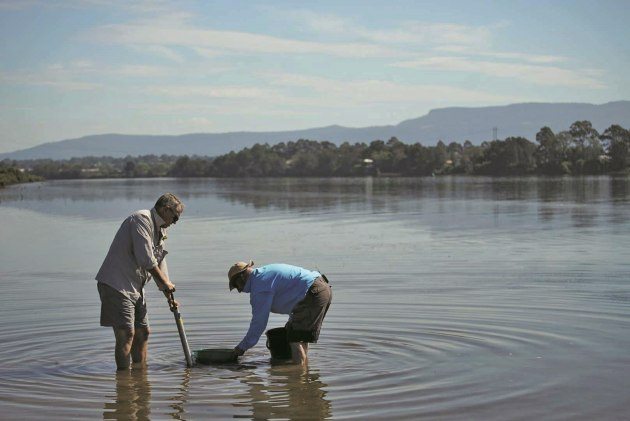 By trying a few areas within a kilometre or two you will learn heaps about where the fish are in any given estuary. Look for structure and bait. Nearby you might find yabby beds and flats with small fish roaming around on them. Now see where the water goes as the tide falls. I bet there are flatties, whiting and bream somewhere along there. Fish low light periods and after dark if possible. Avoid crowded and well used areas and seek out quiet areas away from skiers and swimmers. Kayaks and canoes can open some waterways that bigger boats can’t access. If you're too young to drive remember that many people overlook the water nearby and some great fishing can be had if you get up early. Poke into the mangroves and up narrow channels and don’t be surprised at some of the fish and mud crabs you see.